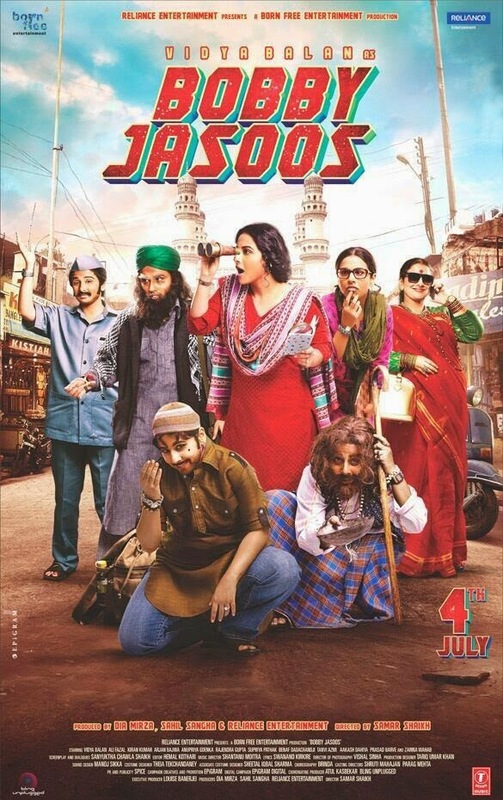 Bobby Jasoos is about Bobby and her desperate efforts to become a renowned detective. Bobby is a rebel and at the same time smart. She thinks out of the box. Vidya Balan as Bilkis aka Bobby thinks, fights, chases and does all the possible heroism you can think of. She disguises herself in many avatars and looks convincing enough. I liked the simple salwar suites she wears and the fact that she also repeats a few of them; like you and me. Ali Fazal as Tasawur is cute, sweet and handsome. Whenever he comes onscreen, a song breaks. Supriya Pathak as Bobby’s mother loves her daughter as she is and at the same time, is a silent and helpless spectator of the cold war between the father-daughter. The screenplay is interesting and very different in the first half and a little too dragging in the second half. The climax is clichéd as if the movie wants to give a clean chit to every character before “The End”. The dialogs are smart. But, the Hyderabadi slang was a little tough for me. So, I found it hard to follow, at times. Arey! I am being honest. The songs are ok-ok types. None of it stays in our heart and some are misplaced too. The crowd and the small-yet-crowded lanes of Hyderabad is captured nicely. What makes Bobby Jasoos a must watch is its sheer brilliance and different approach to heroism. I was not looking at a Vidya Balan - a female. Instead I was looking at a hero who is brave and ambitious. She knows her limits and she is spontaneous too. I appreciate the director for such a bold and different approach to heroism. In short, go for the movie. PS: If you are a woman, you will 100% enjoy it. Disclaimer: I am not a feminist. But, this movie presented Vidya Balan as a human being with brains. Generally, majority of the movies typecast women as a glam-doll, meant to dance and romance. This movie is different that way. It asks on the face, who said heroism is a man’s forte! It is true,people have attributed heroism,leadership etc.to masculine gender. And this movie breaks free from all those cliches! Nice review. Yet to watch it though. I quite like Vidya Balan. She has interesting disguises in this movie. Should be fun! I want to watch it ... let's see.